A meticulous literary study, a detective story à la Edgar Allan Poe, a treasure-hunt worthy of an adventure novel—such is the register in which can be deciphered the hidden secrets of a poem like no other. 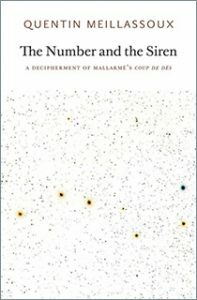 Quentin Meillassoux, author of After Finitude, continues his philosophical interrogation of the concepts of chance, contingency, infinity and eternity through a concentrated study of Mallarmé’s poem Un Coup de Dés, patiently deciphering its enigmatic meaning on the basis of a dazzlingly simple and lucid insight with regard to Mallarmé’s ‘unique Number’. The decisive point of the investigation proposed by Meillassoux comes with a discovery, unsettling and yet as simple as a child’s game. The Number that ‘can be no other’ can only be revealed to us via a secret code, hidden in the Coup de dés like a key that finally unlocks every one of its poetic devices. Thus is also unveiled the meaning of that siren, emerging for a lightning-flash amongst the debris of the shipwreck: as the living heart of a drama that is still unfolding. 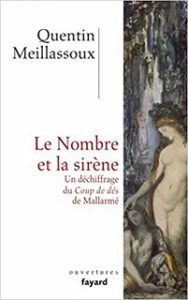 With this bold new interpretation of Mallarmé’s work, Meillassoux offers brilliant insights into modernity, poetics, secularism and religion, and opens a new chapter in his philosophy of radical contingency.